Visitors looking for a more contemplative experience can check out these landmarks, museums, and meditation centers. You could spend a lifetime in New York City and never run out of museums to visit, bridges to walk, cuisines to try, and neighborhoods to see. If you’re a Buddhist practitioner or a meditator who wants to take in the sights and sounds of urban Buddhism or fit in a sit between a walk over the Brooklyn Bridge or boat to Ellis Island, there are plenty of opportunities to do so while you’re here. Buddhist roots run deep in the Big Apple. Japanese Zen master Sokei-an Shigetsu Sasaki was the first Zen master to live in the United States, landing in New York and starting the Buddhist Society of America—later renamed the First Zen Institute of America—in 1931. Outside the Buddhist Church of America on Manhattan’s Upper West Side, a Pure Land sangha, you can find a 60-foot statue of Shinran, the founder of Shin Buddhism, that survived the atomic blast in Hiroshima and was later deemed safe and shipped to America. Buddhist temples in Manhattan’s Chinatown became cultural hubs for Chinese Buddhists, and no matter what tradition or secular practice you align with, you’re likely to find a practice center here. If you’re spending a few days in Tricycle’s hometown, here are a few sights to see and places to get grounded amid the hustle and bustle of your 8 million new neighbors. The Rubin Museum of Art in New York City’s Chelsea neighborhood showcases the art of the Himalayas. It’s well-worth a visit to see the 13th-century sculpture of Green Tara, Tibetan mandalas, or some of the modern programming based on ancient wisdom. But be sure not to miss the permanent Tibetan shrine room. Modeled on an “affluent household shrine, the room holds more than a hundred religious items, including sculptures, paintings, bowls, and instruments and is an opportunity for visitors to see religious art in the context that it was created for,” the museum boasts. Seats and prayer beads invite visitors to sit in contemplation. Tibet House is a cultural organization that was founded in 1987 after His Holiness the Dalai Lama expressed the wish to have a space aimed at preserving Tibetan customs. The center includes an art gallery, bookstore and gift shop, and small shrine room for personal practice. Teachers from the Nalanda Institute for Contemplative Science lead lunchtime meditations from 1–1:45 p.m., Monday–Thursday. Monday’s practice has a social justice spin, and all the sessions are suitable for beginners. Added bonus: you might be breathing next to a Tricycle staff member (it’s our go-to spot)! The Village Zendo started as a practice group in Roshi Pat Enkyo O’Hara’s apartment more than 30 years ago. This Soto Zen group has since grown to about 100 students, and the zendo is located in SoHo, a neighborhood with distinct cast-iron buildings that once housed artists and musicians. South of Houston Street is where the world comes to shop, which you can do before or after their lunchtime zazen (from 12:30–1:30 p.m., Monday–Friday). If shopping isn’t your persuasion, stroll past the arch in Washington Square or escape from the throngs of tourists by catching nearly any subway line within a few blocks. New York Zen Center for Contemplative Care, cofounded by Sensei Robert Chodo Campbell and Sensei Koshin Paley Ellison, was the first Zen Buddhist organization to offer fully accredited chaplaincy training in the U.S. The center offers a half-hour midday meditation, 12:30–1 p.m., Monday–Thursday. The Shinnyo Center for Meditation and Well-being offers several meditation classes a week around lunchtime (be sure to check the schedule of monthly offerings here). The center also includes cultural information on Shinnyo-en, a fast-growing global Buddhist community founded in Japan in 1936 that encourages practitioners to bring altruism into their lives. For visitors looking for something in the Theravada tradition, New York Insight Meditation Center holds its Living Urban Dharma daytime sit on Mondays from 12:30–2:00 p.m., which includes sitting and walking meditation as well as a dharma talk and discussion. The Midtown center is an offshoot of the Insight Meditation Society founded by Joseph Goldstein, Jack Kornfield, and Sharon Salzberg. 28 West 27th St.,10th Fl. If you spend some time exploring Chinatown, you’re likely to stumble upon smaller Buddhist shrines tucked away on side streets. But you can’t miss this Chinese Mahayana temple, which is both the largest Buddhist temple in the city and home to the city’s largest Buddha statue. This is the “city campus” of the Eastern States Buddhist Temple of America, founded in 1962 to serve the Chinese community in New York City, many of whom later became disconnected from their families back in China after the Cultural Revolution. This city temple opened in 1997, and it’s hard to miss the facade and bright red doors flanked by dragon statues. Inside you’ll find a series of paintings depicting the Buddha’s life, a Medicine Buddha shrine, and a gift shop. A calendar of events and ceremonies are posted outside the temple, and visitors are asked to dress appropriately and not take photographs. And while you’re in the neighborhood, be sure to fill up on soup dumplings (at Shanghai Cafe or Joe’s Shanghai), dim sum (at Nom Wah Tea Parlor), or kosher vegetarian fare (at Buddha Bodai). Open daily 8:30 a.m.–6:30 p.m. If you’re looking to get in an early sit or more secular practice, and want to explore upper Manhattan, you’ll find an inviting home at Mindful Harlem. Saturday morning classes start at 9 a.m. with a dharma talk, leading into a guided meditation, mindful movement, and a period for community reflection before wrapping up at 11:00 a.m.—giving you plenty of time to explore 125 Street, take a tour of the Apollo Theater, sample soul food at Sylvia’s or Amy Ruth’s, and more. A few years back, the Lonely Planet Travel Guide named Queens as the top travel destination in the United States. 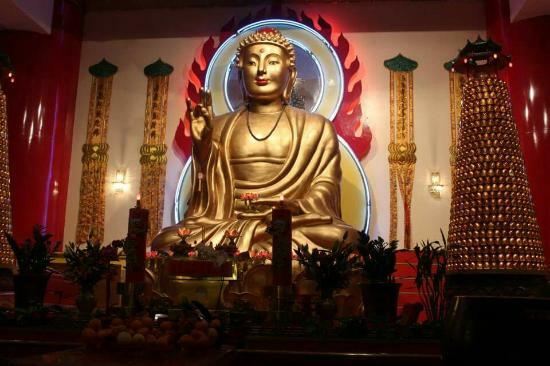 And the borough has earned that title with the Theravada Wat Buddha Thai Thavorn Vanaram, which is located in a residential neighborhood in Elmhurst, Queens. The ornate temple was founded in 1994, and the temple grounds have sculptures of Buddhist figures, including a very large reclining Buddha. Come hungry—Jackson Heights and its famous Indian, Tibetan, and Nepalese shops and restaurants are a short trek away.